Retirement is the bittersweet truth of life. It is a life stage that is unavoidable. These salt and pepper years bring dreams of relaxing and staying home, doing what you have always wanted to do. But, are you prepared enough today to make your retirement days memorable? The thoughts about retirement also put your mind overworking in terms of ensuring the financial well-being for the later years of life. It is a tough world out there and planning well for your retirement in terms of financial security is of paramount importance. Retirement planning should lead to a sustainable lifestyle as per your expectations and liking. Factors like your age, number of dependants and their expected status at the time of retirement play an extremely important role in your retirement planning. Let’s understand what it takes to ensure that you retire like a boss – on your terms and conditions, when you finally bid an adieu to your work life. Experts believe that starting early on investments is the best thing to do. In fact, as early as your first income! At a young age, you have lesser liabilities, more money at hand to invest, are in good health and have a good risk appetite. Further, you can keep long term investment horizon and reap the benefits of the power of compounding. The earlier you start, more your corpus will multiply! It is useful to calculate a retirement corpus to arrive at concrete numbers. Do not let it hang in the air; instead create a document which gives realistic and logical estimates of your savings, income flows vis a vis expenditure. All you have to do is begin adding expenses that come with old age like basic amenities and health care; and reduce expenses like loans and child’s education that are expected to cease by that time. 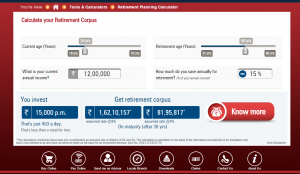 How to determine a retirement corpus? Let’s take an example. Rajendra is a 30 year old male who earns Rs.12,00,000 lakhs annually. He saves 15% of his annual income or Rs.15,000 per month for retirement needs. He intends to retire at the age of 60. Given these factors, his retirement corpus would be around 1.62 crores at an assumed rate of 8% and Rs.82 lakhs at an assumed rate of 4%. During your earning years, make sure your investment decisions are well thought of. Remember, every penny saved is a penny earned. Your investment portfolio should be a mix of equity and debt funds. This would ensure better returns and flattening of risk. For short-term and medium-term liquidity, you could invest in fixed deposits / PPF and mutual funds respectively. However, the flip side is that fixed deposits and PPF have low returns after discounting tax and inflation. While, mutual funds are highly subject to market volatility. So, you should consider investing in long term instruments. These days, financial institutions like ICICI Prudential offer specific retirement pension plans to meet your retirement needs. These are basically pension plans in which you can invest systematically so that you can accumulate a huge corpus by the time you retire. Additionally, these pension plans give steady returns, life insurance coverage and tax-saving benefits. It is never a good idea to pick a loan tab closer to your retirement age. In fact, ensure that all your installments on already continuing loans also get paid much before your retirement. The golden rule to follow is to never get retired indebted. Investing in life insurance can go a long way in your retirement planning. Usually, people think that life insurance is the need of young age, when there are dependents and liabilities like home loans. However, with the non-retirement phase becoming longer, you may still have dependents to take care of. Life insurance can give you peace of mind. It will protect your dependents, secure their future, take care of their regular expenses as well as help them pay off debts, if any, in the case of an unfortunate event of your demise. It is also advisable to invest in your health. That is, get a health insurance cover. A World Health Organization (WHO) study* indicates that over 70% of Indians still pay for medical expenses out of their pockets. Even the health care cost has risen to 6.8% in 2015 from 6.5% in 2014. An early insurance that also covers major illnesses will cover your medical expenses in the later years of life without creating any additional burden on your retirement corpus. Retirement is meant to live a carefree life. Simple steps and careful financial planning can help to make your retirement phase truly golden! The key is to start early, invest smartly and do it systematically.